In our day to day life, we come across a large number of Recommendation engines like Facebook Recommendation Engine for Friends’ suggestions, and suggestions of similar Like Pages, Youtube recommendation engine suggesting videos similar to our previous searches/preferences. In today’s blog post I will explain how to build a basic recommender System. 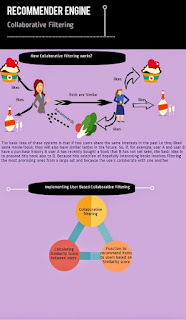 In this post will explain about User based Collaborative Filtering. This algorithm usually works by searching a large group of people and finding a smaller set with tastes similar to yours. It looks at other things they like and combines them to create a ranked list of suggestions. For recommending movies for Chan using the above similarity matrix, we need to first fill the N/A where he has not rated. As first step, separate the non-rated movies by Chan and a weighted matrix is created by multiplying user similarity score (user_sim[,7]) with ratings given by other users. Recommending movies for Chan will be in the order: Matrix (3.48), Titanic(2.81), Inception(2.35).